The best place to go skiing in Europe, Val d’Isère has a ski area of 300 kms of ski runs for all levels. Benefit also from ski from november to april and from summer skiing on the Pisaillas Glacier opened from the beginning of june to mid-july. Where to ski in Europe? Val d’Isère is the ideal place to ski with family. This French ski resort has one of the largest ski areas in Europe with 300 kms of ski runs, 1900 metres of verticals and the legendary slopes – the Face de Bellevarde – theater of numerous World Cup skiing events. In addition, the ski resort conceals many typical accommodations for your ski stay and particularly catered chalets with warm and confortable atmosphere. Val d’Isère is a large ski area with snow and very favorable weather conditions for skiing. For example, in 2016, the Savoyard resort benefited from an average snow cover of 91 cm with 53 days of snow. For best skiing in Europe from November to april and in summer choose the Val d’Isère ski resort. The altitude of the ski area, between 1900 and 3000 metres above sea level, is a major factor. In Val d’ isère take advantage of the snow guarantee to ski in any season. Building on these strengths, Val d’ Isère offers numerous promotional offers on spring and summer skiing. This last one is practiced from the beginning of june to mid-july in the morning on the Pisaillas glacier. A shuttle bus will take you from the resort to the glacier’s foot with all-inclusive packages with discounts for children from 5 to 13 years old. 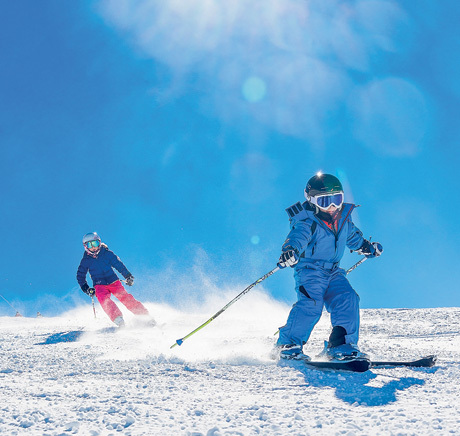 Treat yourself to the pleasure of skiing in the middle of summer at an altitude of over 3000 metres.